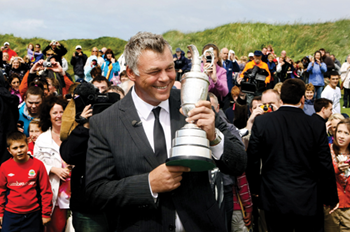 Darren Clarke took home a well-deserved reward at Royal St George’s. A three-shot victory won the British Open for Darren Clarke this July, the high point of a 20-year career. The Claret Jug was his after a final score of 275 (68-68-69- 70). While McIlroy made the record books for his youth, Clarke made the mark as the oldest Open champion since Roberto Di Vicenzo in 1967 and the oldest major winner since Ben Crenshaw in 1995. He is the only second Northern Ireland player to win the championship, after Fred Daly in 1947. It was an emotive moment for the 42-year old, who lost his wife Heather to cancer five years ago. His two sons, Tyrone and Conor, and fiancée Alison Campbell shared in the triumph. Clarke was especially happy to make his boys proud. His mother Hetty added: “Everybody knew he had the talent. It was just for him to believe he had the talent and it came through this week.” Roaring from the fans helped him along. Celebrations centred on the Royal Portrush, in the Dungannon man’s adopted home town. He later showed off the trophy to surprised tourists at Portballintrae’s Bayview Hotel. It’s a crowning glory for the man who mentored Graeme McDowell and Rory McIlroy, and gives Northern Ireland three major champions for a population of 1.8 million people. He presented his gold medal to Royal Portrush, where it sits beside Fred Daly’s. Clarke is hoping for more majors and, looking ahead to 2015, to bring the Open to the North Coast links, where it was last played in 1951.